Note: the climb from laban rata (the base camp) to the summit started at 2 am. so pictures of the climb has been taken from going back down. Most of these will be shown in reverse. At 2AM we gathered in preparation to climb, some of us even tested the comfort of our clothing outdoors for a few minutes. It was cold, so cold I was hoping that the climb would heat my body up, or the night would warm up with the impending sunrise. We had to wait one more member (Lim) as he alone of our group was hungry enough to eat breakfast down at laban rata (about 100 m downhill and double back). By now there were some groups that went up already. 13th April 2010 – Meet at The mall, gadong and leaving Brunei for Kota Kinabalu. When we get there, we either rest or walk around, then sleep in hotel. 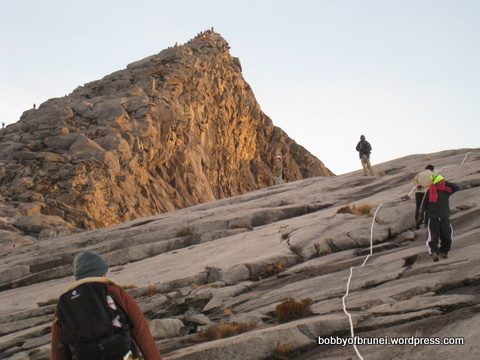 14th April 2010 – Going off to the Kinabalu National Park, Rest there one night. 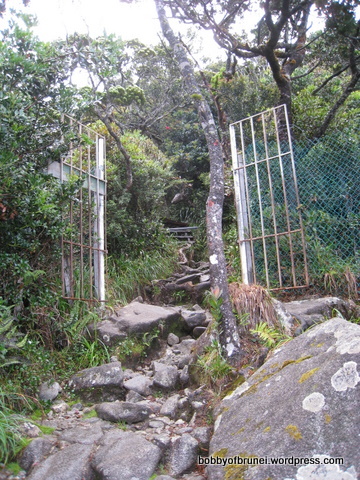 15th April 2010 – Climb up to Laban Rata, the resting point in the middle of the mountain. Gonna rest early like 7 or 8 pm to wake up for the climb the next day. 16th April 2010 – Start climbing to the summit at 2 am. expecting to arrive at the summit before sunrise. Walking back down to laban rata and having lunch, then continue to the foot of the mountain, and going back to Hotel. 17th April – Going back home to Brunei! hopefully with a sense of a great achievement! Here’s a picture of the Mountain that I get from wikipedia/wikimedia. Isn’t that view majestic… and to think I’m going to climb that thing! At the end of the trip I think I’ll talk about Goal Setting.